Micajah Clark Dyer - Georgia's 1874 Pioneer Aviator Micajah Clark Dyer: Who Was Micajah Clark Dyer? Who Was Micajah Clark Dyer? Who was Micajah Clark Dyer? Everyone knows the answer to that question, right? While Union County and much of Georgia were recently introduced to the 1800's inventor and aviator, not everyone knows. Thousands of visitors come to Union County each year from across the country and around the world. 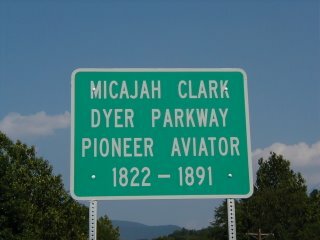 Would they know who Micajah Clark Dyer was when they drive down the parkway named for him? 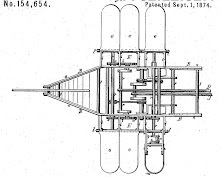 Clark's invention came at a time when advancements in aviation had taken a back seat during the Civil War in the 1860's. The economy in the south was still in ruins with reconstruction barely underway when Clark filed for his patent in 1874. His achievement came at a most unexpected time when economic, political and scientific odds were against anyone trying to invent an aircraft in the U.S.
Dyer family members discussed the question of who Clark Dyer is with Rep. Charles Jenkins. Jenkins coordinated the effort to update the Micajah Clark Dyer Parkway signs to include two important aspects about the man the highway was named for. The signs now include two lines that help passersby understand Clark's role in Georgia's, and Union County's, rich history: "Pioneer Aviator" describes Clark's life-work and passion, as well as "1822-1891" delineating his life span. The family wishes to thank Rep. Jenkins and the Georgia Department of Transportation for their work in updating the signage. I first read about the amazing flying maching of Micajah Clark Dyer from an article that apeared in the Gainsville Times in 1980. I was excited because my Great great grand father was also named Micajah Clark Dyer and I wanted to find out if this was him. I got in touch with Watson B. Dyer and found out that My Micajah was not him. I am decended from James Marion Dyer's son Micajah. What a wonderful piece of family history. I figured that it was true, but that it could never be proved. Thank you for hanging in there and blowing the dust off of one of the best kept secrets in aviation history! I am proud to be a distant relative to such a great inventor and pioneer who is finally getting his proper recognotion. Well done! 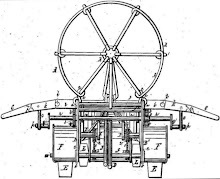 Micajah Dyer was my Great Great Grandfather and I have been told the legend of him inventing the first airplane. Most people that I told thought I was crazy!! It's good to now have proof!